One thing I love about our assessment work at Grow Communication is the opportunity that we have to get to know so many phenomenal individuals. And the chance to create an assessment space that is right for each one of those individuals. On this occasion it involved my very lovely puppy Paddy (I think he should be our mascot) and a big box of chocolates. What we aim to do is to create a space where an individual and their family can explore, and feel valued, supported, listened to and not hurried out of the door. We aim to unpack what is going on and give bespoke, individualised recommendations so that families feel that they can move forward with greater clarity. Our assessments are detailed and time consuming and the reports long, but when Paddy (and of course the clinicians) get testimonials like this we feel encouraged that this is valuable and worth it. “I approached Grow Communication for a PDA profiling assessment for my son (Grow) being the first Independent Team to be listed by the PDA Society in Scotland. I have been overwhelmed by the thoughtful caring attitude of both Jude and Suzy to both myself and my son. I was blown away by their diagnositic skills and most importantly how they turned round years of negativity through Education into so many real Positives . The child they saw had been courageous and resilient throughout, not “lazy and winging it” as many had thought. Jude even brought her dog Paddy in from home when I mentioned my son loved dogs. The report is not a copy and paste response but a bespoke detailed informative report individual to my sons needs for Education and to further his life skills . We were given suggestions which type of assessment to use. Our opinions were respected. Their research evidence went back as far as grandparents in great depth. Having Clinicians who understand the PDA profile was a lifeline. Grow Communication is a social enterprise based in central Scotland. They offer bespoke assessment and therapy for those with speech, language and communication difficulties and multidisciplinary assessment for Autism. 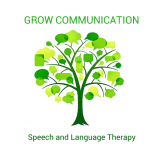 Grow Communication is the first independent assessment service to be recognised in Scotland by the PDA society. This entry was posted on January 21, 2019 by judephilip in Uncategorized and tagged ASD, autism, autism asd adhd diagnosis, communication, Complex needs, grow communication, jude, pathological demand avoidance, PDA, speech and language therapy, testimonials.